The card foundation and vines are from the Toil and Trouble SVGCuts set . 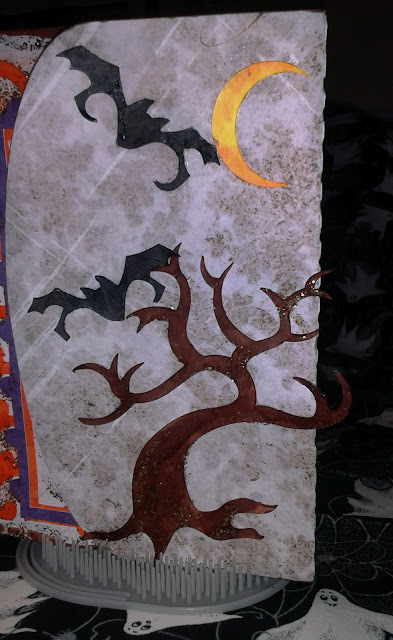 The Gothic Gate is from one of the freebie files that Mary and Leo so generously give their fans. You can download it here Gothic Gate from SVGCuts.com . 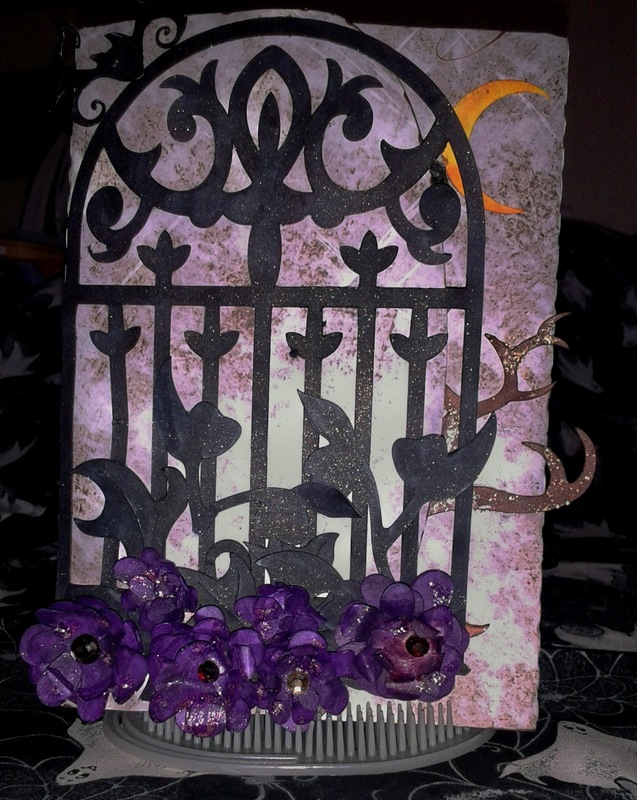 The flowers are from the Elegant Witch Hat Card in the Haunted Hemlock Cards SVGCuts Kit , I just simply reduced the size of the flower pieces down (quite a bit) and then made these gorgeous dark purple flowers to go on the vines and gate. The flowers were cut from white cardstock and then colored with a few different Bic markers. I then put a few dark purple stickles on the flowers. The gate and vines were sprayed with a metallic glimmer mist. The middle of the inside of the card uses the SVGCuts Elegant Gothic Frame (yet another wonderful freebie from Mary and Leo!). The skull is also from the Toil and Trouble SVGCuts set . The stamp on the inside of the flaps are from a set I have had for long time and unfortunately do not have the name of any more. I used Tim Holtz distress stickles in Black Soot and Frayed Burlap around the edges and throughout the center inside panel. 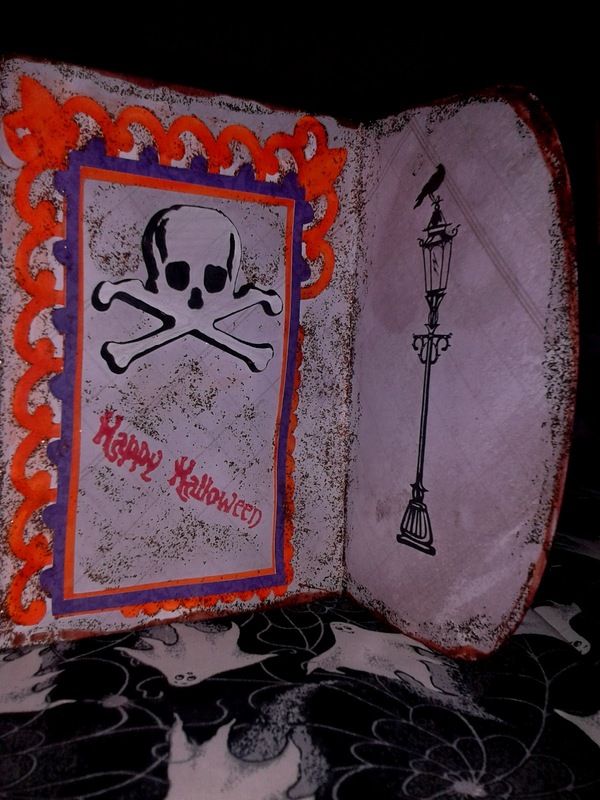 Well thanks for taking a look at my first Halloween card of the 2012 season. I'll be back soon with more posts and hopefully a few new free files. thank you for sharing how you made this card, I love it!